Magco makes helical gear boxes one built on modular concept of construction conformation to is standards with respect to sizes, dimensions. This provides economics mass production, comprehensive maintenance of stocks, favorable delivery period and easy of servicing. Housing : - Rigid, robust, torsion resistant housing in high-grade cast iron to dampen vibration and resist the heat generator when units are operated at their max. Capacity produced in most modern foundry in house. Housing in cast steel or fabricated steel can be supplied if required. 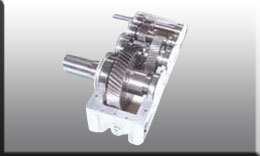 Gears and pinion:- The gears are generated with highest accuracy on hobbing machine. The material for the pinion and gear wheel are made of hardwareing special steel of graded strength to meet the individual load conditions. The selection is made of module, tooth profile, and material is made in conformity with speeds, ratio, and load conditions to give maximum tooth contact and overlap, thus ensuring most favorable meshing and soundless running. Shafts: - Shafts having pinions cut integral are of heat-treated alloy steel and are finished to high precision tolerance by grinding. Bearings:- Anti-Friction bearings of ample size are used throughout to ensure long service life. The use of antifriction bearing ensure high efficiency, correct center distance and proper shaft extensions are fitted with quality seats to prevent oil leakage and dust entry. Lubrication :- For normal speeds, gears dipping in oil provide splash lubrication. The oil level indicator located in the housing is to ensure a proper amount of lubricant in the housing. Cooling:- Heat generated within the gear units is dissipated by a sufficiently large surfaced area of the housing for higher capacities additional cooling is provided by fans cooling coil inside lower housing depending on heat dissipation requirement based on power to be transmitted and ambient temperature.